Joy of joys, there’s a scrumptious new magazine on the horizon – The Simple Things, created by the lovely people who send me Mollie Makes every month, ‘celebrating the things that matter most’. Needless to say, I’ve already taken out a subscription, and can’t wait until September, when the first edition will land on my doormat. The title of the new bible got me thinking, that I would snap and share my simple pleasures on this blog. It remains to been seen how many simple pleasures will reveal themselves to me, and therefore how often they’ll appear here. My first simple pleasure is unexpectedly finding something so cute and loveable that it just had to come home with me. Needless to say, I didn’t go shopping for a vintage miniature ironing board, but once I had spotted it, it had to come and live in our playroom. I love it, it’s cute and I think it has some stories to tell. Priceless. I so agree! I love unexpectedly finding treasures I am not even searching for. 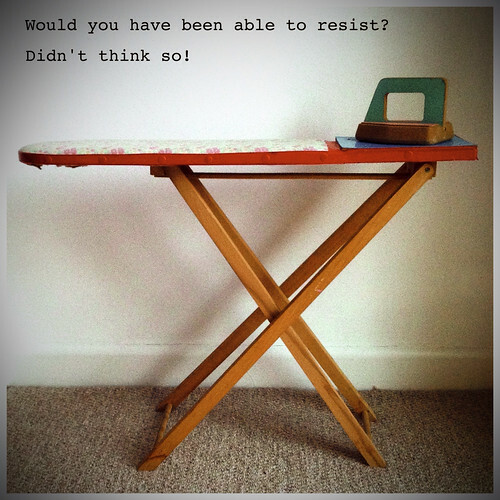 Your little ironing board and iron is adorable and would look great in a playroom.